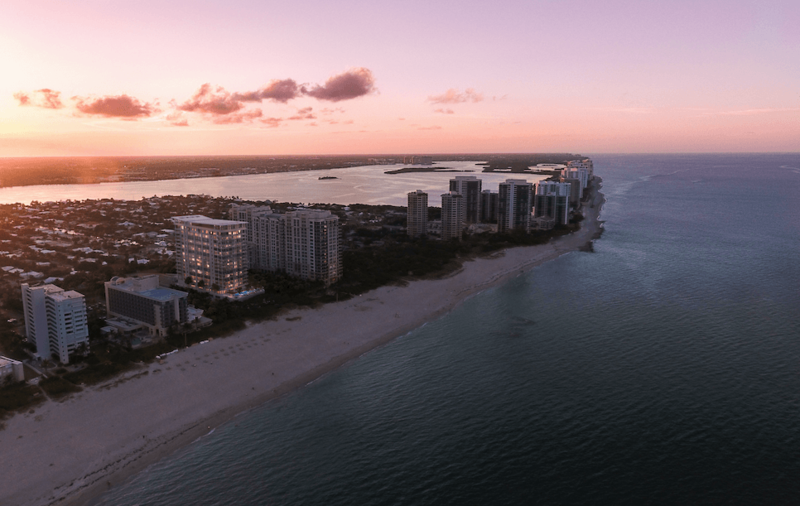 SINGER ISLAND, Fla. (March 13, 2018) – The winter sales season produced a number of new buyers at VistaBlue Singer Island, the first oceanfront luxury condo to deliver in Palm Beach so far this year. The property is now 70% sold with only 18 units remaining, including a 6,242-square-foot, 4-bedroom penthouse on the 19th floor featuring spectacular views of both the Atlantic Ocean and Intracoastal Waterway listed for $7.646 million. Closings are scheduled to begin in April, with a grand opening celebration tentatively scheduled for May. Due to pent-up demand for luxury product in Palm Beach County – and on Singer Island in particular, which hasn’t had any new development in almost 10 years – sales at VistaBlue Singer Island were brisk throughout the past year. This has allowed for the implementation of planned tiered price increases – the fourth such increase since marketing began in 2016. Designed by architecture firm GliddenSpina, with interiors by award-winning firm Interiors by Steven G., residences at VistaBlue feature 10-foot high ceilings (12-foot in the penthouses), open modern floor plans, floor-to-ceiling windows, imported Italian porcelain tile flooring indoors and out, designer kitchens with Poggenpohl® custom cabinetry and Miele® appliances, and oversized wrap-around terraces offering sweeping views of the Atlantic Ocean and Intracoastal Waterway. Five-star amenities include an elevated pool terrace and sundeck overlooking the Atlantic, a club room and social lounge with two bars, and a state-of-the-art fitness center with his and hers saunas. Less visible, but equally remarkable construction features include exterior concrete reinforced with galvanized steel to prevent corrosion from the ocean air; mold-resistant drywall and waterproof stucco; enhanced soundproofing between floors; 150-mile-per-hour hurricane impact windows; level five drywall finishes; and a waterproofed electrical main. Third Palm Capital is a national real estate investment and development firm that owns, operates and develops diversified properties in select core markets. We rely on our Guiding Principles to deliver the highest quality residential, commercial and resort properties to our customers. We have over $1 billion in assets including active investments in New York, California, Florida, and Texas. Our portfolio emphasizes luxury residences, mixed-use communities and resorts. Third Palm is sponsored by the Dart Family and enjoys substantial capitalization and a long-term commitment to becoming the pre-eminent real estate development form in the United States. For more information, visit www.thirdpalmcapital.com.